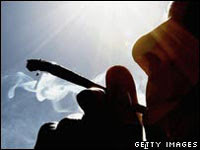 Information Junk: BBC: Is cannabis really a killer? BBC: Is cannabis really a killer? The Liverpool Echo declared it had unearthed super-strength cannabis "so incredibly strong it can bring on the early signs of schizophrenia from a single puff." I have never smoked weed before. Never really been interested. But this article makes me want some of this stuff. God--damn!